Free Printable Multiplying by 6 Worksheets. Free Printable Multiplying by 6 Worksheets that can be of great help for kids. 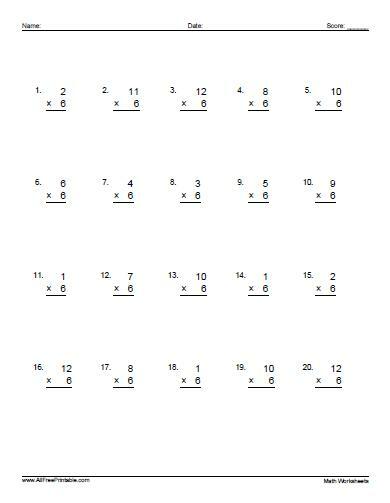 Use this math worksheet to help kids improve multiplication skills and multiply by 6. Don’t have to buy math workbooks print the Multiplying by 6 Worksheets free using your home laser or inkjet printer, and share with kids at classroom. Select from 1 Multiplying by 6 Worksheet with 20 problems and the answers on page 2. More will be added soon. Click the link below to download or print the Multiplying by 6 Worksheets now in PDF format.